There are many ways to build fine teams. 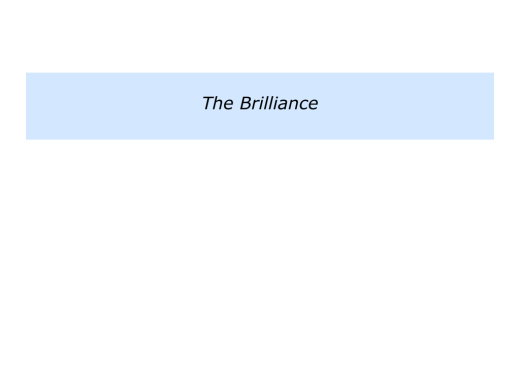 This article looks at how you can help people to build on their beliefs, keep doing the basics and then add the brilliance. 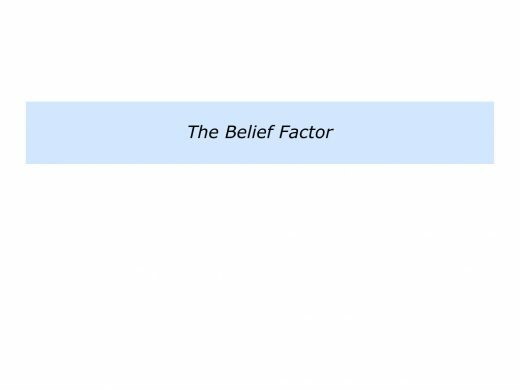 Belief is crucial. People work best when they believe in what they are doing. They also need to believe that, providing they do their best, it is possible for them to reach their goals. Imagine you lead a team. 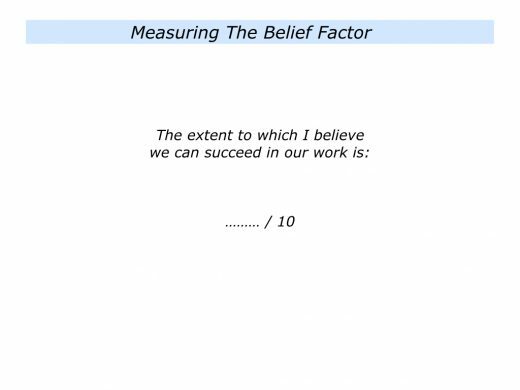 How can you clarify whether people believe in what they are doing and the chances of success? One approach is to do the following exercise. This will provide you with a benchmark. Later we will explore how to build on what people believe the team can achieve. If you wish, invite each person to complete the following exercise. 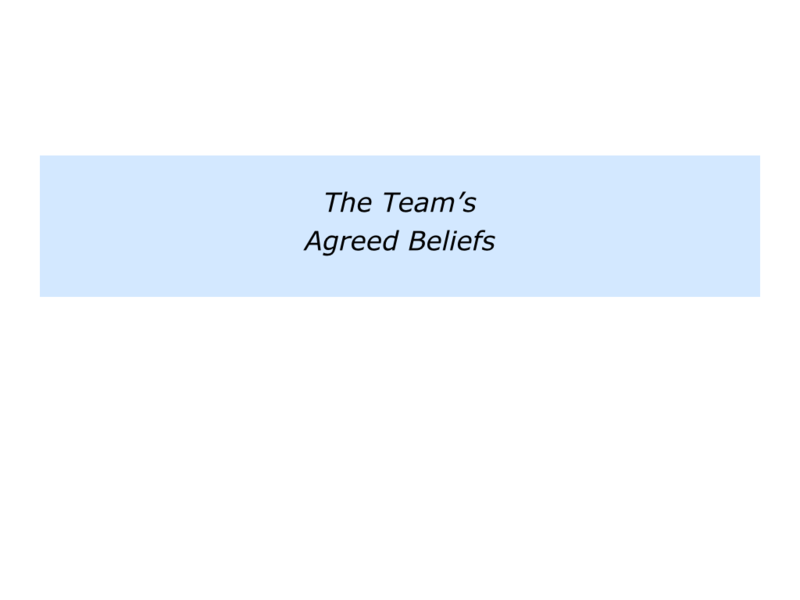 Another aspect of belief is to ensure that the team members are aligned in their beliefs. Sometimes people can depart from the main strategies and simply pursue their own agendas. This can cause difficulties in the team. How to ensure that people are aligned in their beliefs? Here is one approach that I have used in teams. This helps people to clarify the beliefs they have in common. Invite your people to tackle the following exercise. 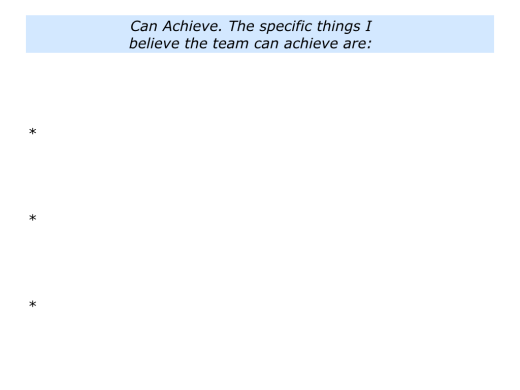 This is rather long, but it will establish what people believe they can achieve. Give each person a pack of Post-it Notes. 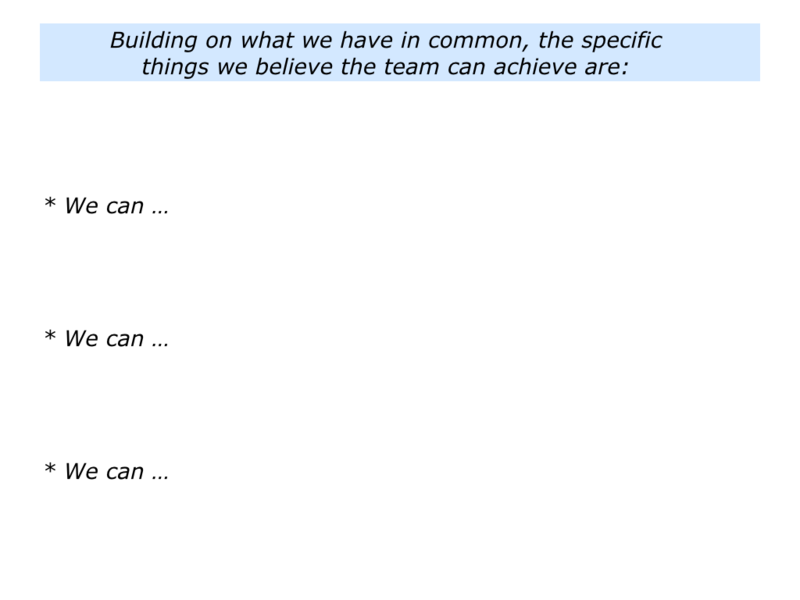 To build on its strengths – the specific activities in which it delivers As, rather than Bs or Cs. To build on what it can control and manage what it can’t control. 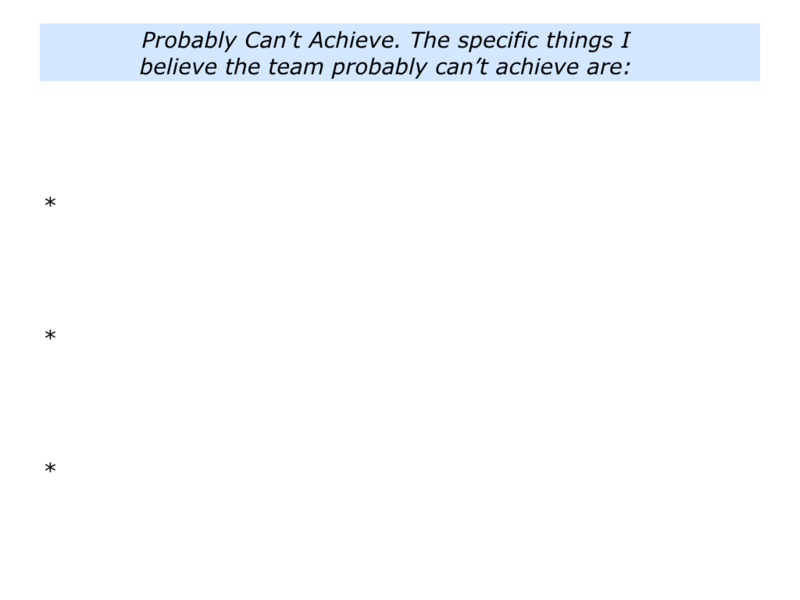 To clarify what they believe: a) The team can achieve; b) The team maybe can achieve; c) The team probably can’t achieve. Bearing these factors in mind, invite each of the individuals in the team to write Post-it Notes under the following headings. Give people 15 minutes to write their Post-it Notes. Ask them to be totally honest in their views. When people have finished, invite each person to go up in turn and put their Post-it Notes under the respective headings. 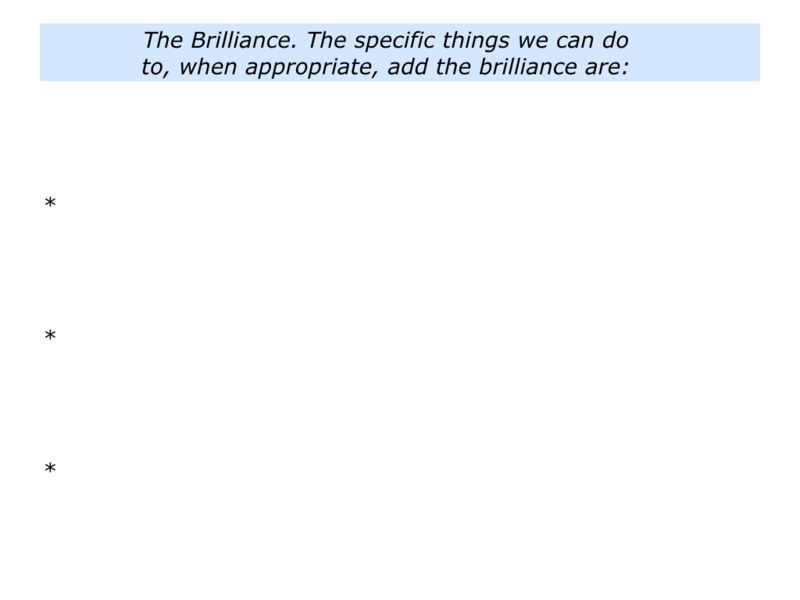 Ask people to give examples regarding what they have written. 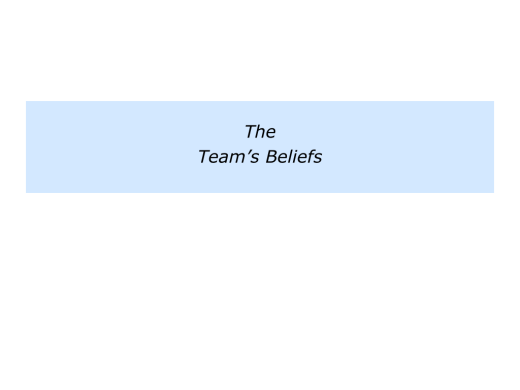 Looking at what people have written, begin clarifying the team’s shared beliefs. Facilitate a discussion around the main headings. The discussion is to be conducted in a spirit of enquiry, rather than telling people they ‘must’ believe. Finally, make provisional agreements about what comes under each of the headings. 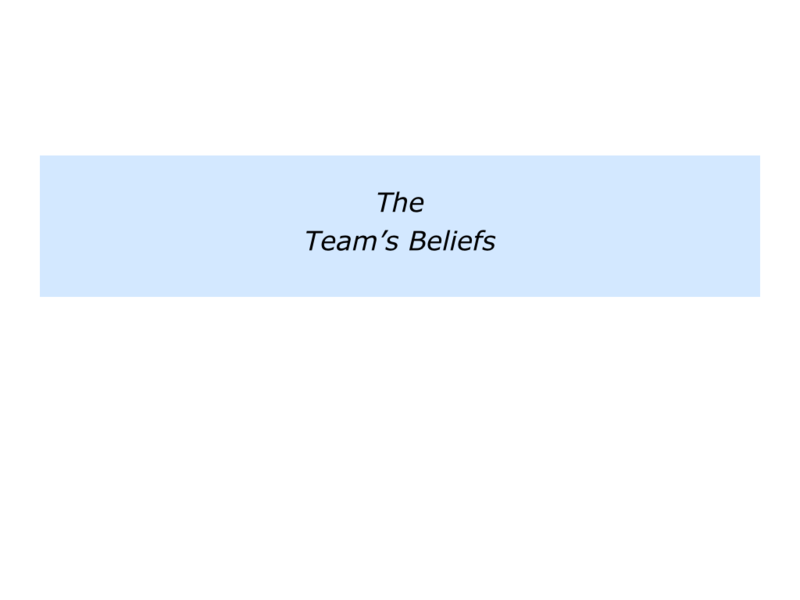 Take away the flip charts and reflect on the team’s beliefs. Ask yourself the following questions. Bearing in mind the team’s beliefs, do we have the basis for translating these into doing the basics and delivering brilliant results? If not, which of the following routes do we need to follow? Do we need to recruit more people who have greater belief? 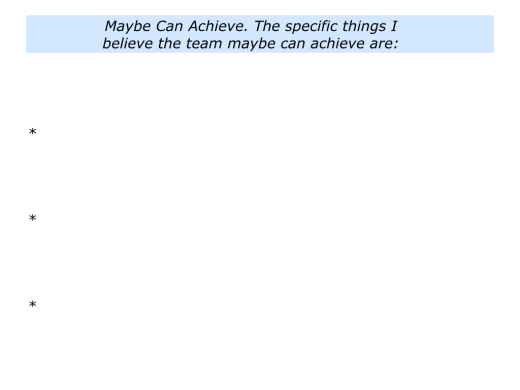 Do we need to find ways to convert some of the ‘maybe can achieve’ column into the ‘can achieve’ column? 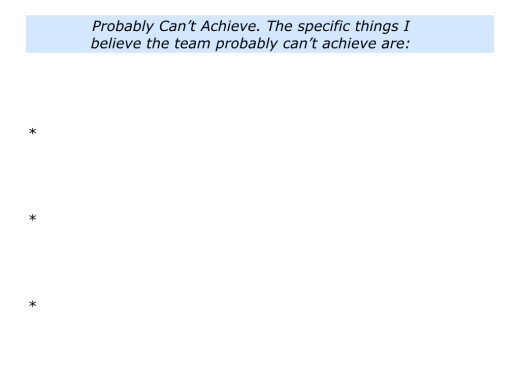 Do we need to do greater research into what our team are being asked to achieve and then see if it is actually possible? Great teams are made-up of people who believe they can achieve a particular goal. If there are people in the team who do not share this belief, then there are two options. You either get people who share the belief or change the goals. 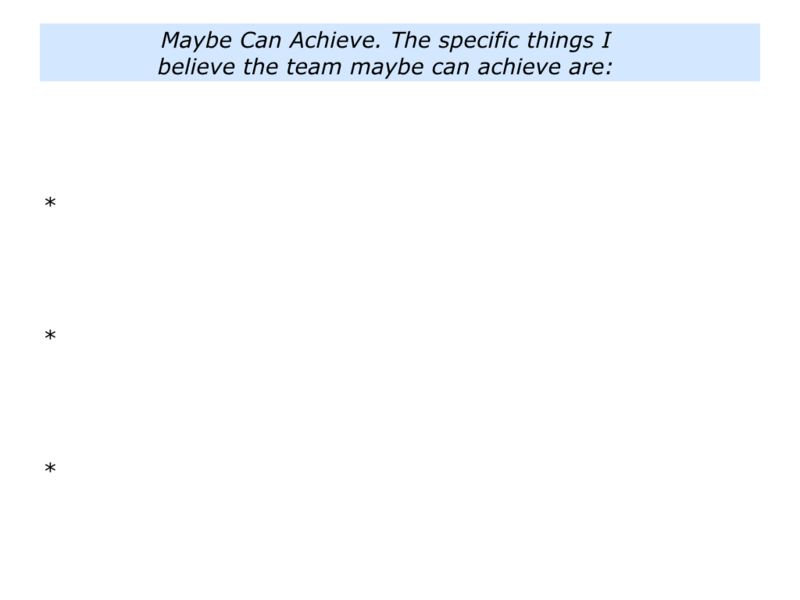 Let’s assume that you are happy with what you believe the team can achieve. Make sure you have people who believe it is possible to translate these beliefs into doing the basics and delivering brilliant results. Bearing this in mind, present back to people the summary of what they and you believe it is possible to achieve. If appropriate, have a short discussion about what has been agreed. 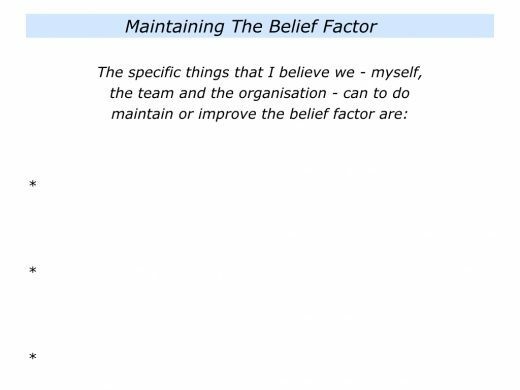 You can then work with the team to focus on how to translate these beliefs into action. Great teams go beyond doing things they believe in. 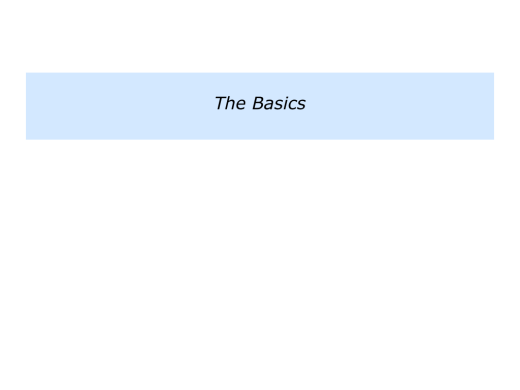 They keep doing the basics required to achieve their specific goals. 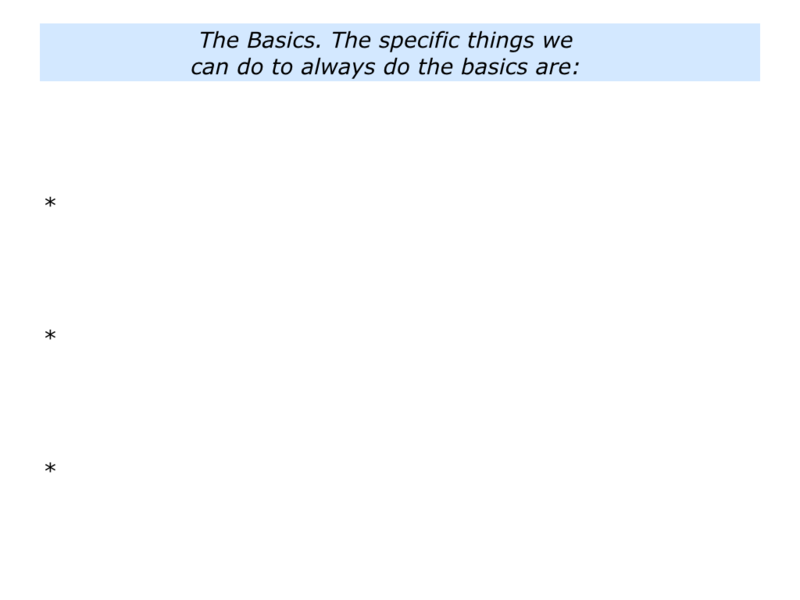 Different teams will, of course, need to perform different basics to reach their desired goals. The principles they follow will depend on whether they work in sports, business, hospitality, medical care, therapy, technology or whatever. Great teams implement the right principles with the right people in the right way. So it is vital to ensure you also have the right people in the right places. You then stand a much greater chance of building a successful team. 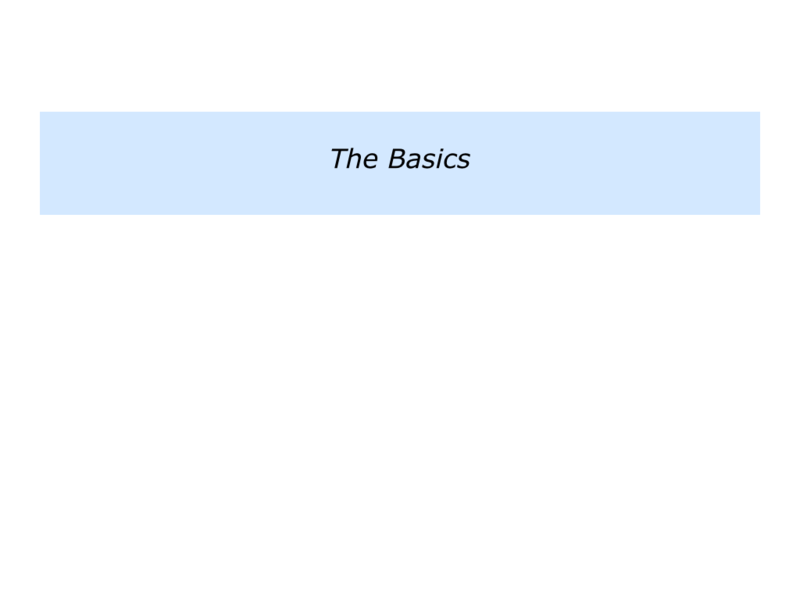 How can you encourage people to keep doing the basics? One approach is to tell them and then supervise the tasks. But this often has only a short-term effect. Another approach is to manage by outcomes. You can explain the team’s goals – the outcomes it must deliver – and then involve people in clarifying the basics. This was the approach was taken by one leader I worked with who helped his team to focus on the basics and the brilliance. The leader explained what happened in the following way. “One year ago my team was in a difficult state. Some people were in love with doing the attractive stuff, but they did not pay enough attention to the basics. “So I spent lots of time supervising their tasks. This wasn’t sustainable in the long term, so I made some key decisions. “First, I decided who might be able to deliver the required professional standards. “Looking at each person in turn, I rated their potential on a scale 0 – 10. I kept the people who had the attitude and ability to reach 7+/10. “I replaced those who didn’t. Two left because they had a poor attitude, one because his skills just did not fit. “Sounds tough, but the alternative was to continue supervising people. This would not benefit anybody. “Second, I then involved everybody in clarifying the basics and the brilliance. Gathering people together, I shared the overall goal. “Each person was invited to write Post-it Notes regarding what they saw as the basics that must be done to deliver the goods. During the 1980s I used this exercise with teams of talented young footballers. Believing they were super stars, the individual players often did their own thing. But success called for them combining their talents as a team. 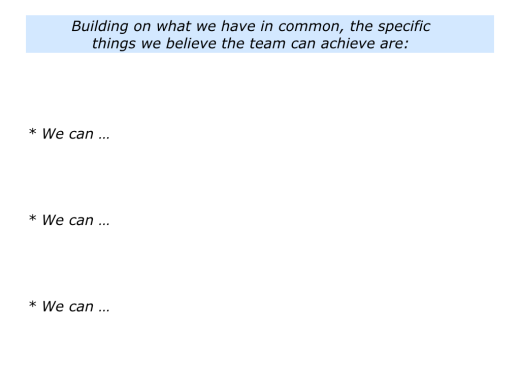 When using this exercise with one team, they agreed on the following principles that everybody should follow. Be positive … Take responsibility … Keep ourselves fit … Arrive on time for training and all meetings … Encourage each other. Play positive football … Be calm … Take control of the game … Keep following the team’s game plan … Keep moving and helping our team mates … Accept the referee’s decisions. Get positive results … Keep doing our best … Keep overcoming setbacks … Keep improving as people and as players … Be good ambassadors for the club. You will have your own method for making this happen. If you wish, however, you can adopt the following approach. Start by reminding people of the things they believe the team can achieve. Bearing in mind these themes, ask people to explore how they can translate these beliefs into action. You can follow the approach mentioned earlier. Invite people to write Post-it Notes describing what they believe people in the team can do to always deliver the basics. Here is the exercise. 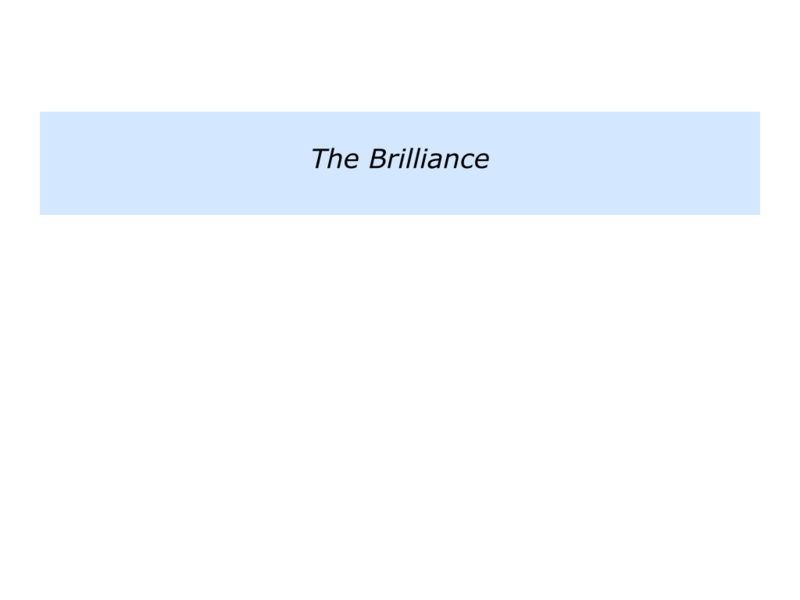 Great teams keep doing the basics and then, when appropriate, add the brilliance. Different teams do this in different ways. The leader mentioned earlier explained his approach in the following way. “I asked my team to focus on adding that touch of class. Looking back, I gave concrete examples regarding when people had taken this step. “Frequently they had done things that were a win-win. They had created a win for the customer and a win for the company. “Sometimes the touch of class had been a creative breakthrough. Sometimes it had been a great piece of customer service. “Frequently it involved people showing the personal touch and helping our customers to succeed. This made the customers more likely to do business with us in the future. “Each person was invited to describe how we could add that touch of class in the future. People wrote their Post-it Notes and put them on a flip chart. There are many models for building great teams. 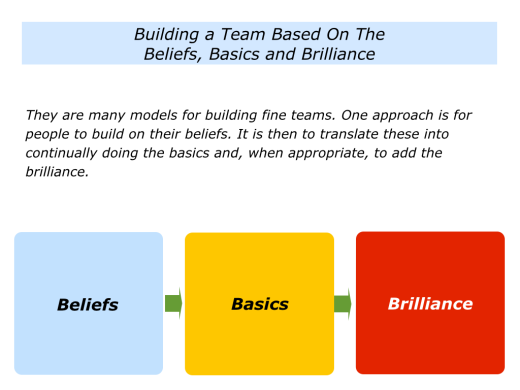 One approach is to get people to build on their beliefs, keep doing the basics and, when appropriate, add the brilliance. If you wish, invite people to tackle the final exercise on this theme. 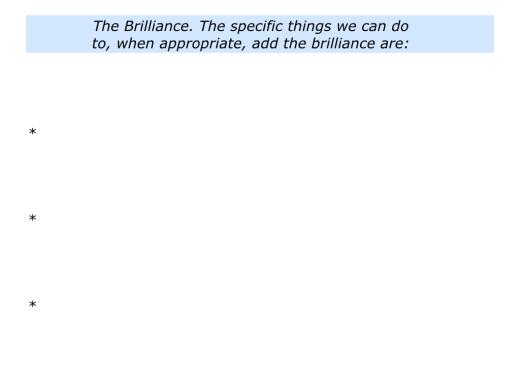 They can describe the specific things people can do to add the brilliance. You can encourage people to keep doing these things and continue to build a fine team.